The Alliance have completed the progress bar to launch The Battle for Stromgarde Warfront in North America! Alliance characters with an item level of 320 or higher can now queue for the 20 man PvE large scale scenario to fight for control of Arathi Highlands against the opposite faction AI. Pick up the quest Warfront: The Battle for Stromgarde and complete the scenario for an item level 370 piece of gear! Warfronts award item level 340 loot baseline upon completion. Alliance characters have 7 days to complete the Warfront before the Horde characters will be able to start to contribute resources to launch their Warfront! It looks like the Alliance Chopper is now live, and can be bought for 100,000 gold in Stormwind. You can find some more detailed overviews of buildings such as the Inn, Lumber Mill, Trading Post, and more in previous news posts. In this series of blog posts, we’re giving you a much closer look at how Garrisons are shaping up and how you can expect to interact with them in Warlords of Draenor. This second installment maps out the buildings that make up a fully armed and operational Garrison and how they impact your professions. As we mentioned in part 1 of this series, we want the process of staking your claim on Draenor to fundamentally shape your gameplay experience. Your Garrison mainly comprises buildings and the Followers who inhabit them. As your Garrison grows, so will your options and opportunities to use these assets to your advantage on Draenor. The Followers that populate your Garrison will grow in number and power, and what they can do for you depends which buildings you choose to construct in your base. Even in its fledgling state, your Garrison will contribute to your professional development almost immediately. You’ll have many choices for what to build, and your choices directly impact what your Followers can do and the rewards you’ll get from them. The space you have available for buildings is determined by your Garrison Tier. At Garrison Tier 1, you’ll have one small and one large plot for buildings of those sizes. Quests will take you through placing a building that matches one of your primary professions in your first small plot and a Barracks in your first large plot. At Garrison Tier 2, you’ll gain one additional small plot, one medium plot, and room for three of four preset buildings: the Fishing Shack, Herb Garden, Pet Menagerie, and Lunarfall Excavation (Alliance) or Frostwolf Mine (Horde). Everyone can eventually unlock and use all four presets, and each provides a great deal of synergy with its associated activities. For example, the Fishing Shack not only allows you to fish in Garrison waters and take on daily fishing quests—it also makes it possible for you to attract Nat Pagle as a Follower and gives him a place to work with you on Draenor. Quests to gain access to each of the four preset buildings become available as you level up your character. You can obtain the mine at character level 92, the Fishing Shack at level 94, the Herb Garden at level 96, and the Pet Menagerie at level 98. At Garrison Tier 3, you’ll gain room for one more building of each size (one small, one medium, one large, and the final preset)—but to start, you’ll want to familiarize yourself with your first building and then consider what you’re going to do with the other precious spaces that become available. Small plots can hold the Engineering Works, Alchemy Lab, Enchanter’s Study, Gem Boutique, Salvage Yard, Scribe’s Quarters, Storehouse, Tailoring Emporium, Forge, or Tannery. Level 1 blueprints all become available to you when your Garrison reaches Tier 2. Small buildings: Reach level 96 or complete the Talador zone. Medium buildings: Reach level 98 or complete the Spires of Arak zone. Large buildings: Reach level 100 or complete the Nagrand zone. Level 3 blueprints become available as you complete certain achievements across Draenor. Level 3 blueprints are account-wide. Once you unlock one on a character, it’s available to all characters on your account. Some of the most impactful decisions you’ll make when planning your Garrison will come when it’s time to choose medium-sized buildings. Medium buildings, unlike the smaller professional workspaces, make use of more real estate to give your Followers room to work on bigger projects with you and interact with each other. Medium buildings include the Horde’s Frostwall Tavern and the Alliance’s Lunarfall Inn, the Barn, the Lumber Mill, the Gladiator’s Sanctum, and the Trading Post. If you go with the Inn or Tavern, each day you’ll find a visitor who offers you a dungeon quest with generous rewards. At level 100, you’ll get two such quests per day. As it grows, you’ll have the opportunity to recruit random followers with traits and abilities that you particularly want—and at its grandest, it unlocks Treasure Hunt missions with hefty payouts. The level 1 Barn grants the ability to capture clefthoof, elekk, wolves, and talbuk for leather and fur that can be used in Leatherworking and Tailoring. To make a capture, you’ll drop a trap and coax low-health creatures over it. At level 2, you’ll learn how to capture boars and riverbeasts for rare meats that are used to cook the most powerful recipes, and at level 3, the Barn will allow you to capture elite beasts and extract their Savage Blood, an ingredient for epic crafted armor and weapons. Meanwhile, over in the Gladiator’s Sanctum, you’ll earn a bonus to your out-of-combat regen in outdoor zones on Draenor, gain the ability to fall safely and breathe underwater outdoors on Draenor, learn a unique damage reduction ability, and ultimately gain access to the intense Highmaul Coliseum gladiator tournament that unlocks a special Nemesis PvP quest series. The Nemesis quest line challenges PvP players to focus on hunting down enemy players of specific races to earn renown and over a dozen character titles such as Draenei Destroyer, Troll Hunter, Orcslayer, and Gnomebane. Truly vigilant players who complete every Nemesis quest will be rewarded with the title Warlord of Draenor. Your Garrison is never intended to be sealed off from the many harsh hazards of Draenor. You and your Followers have work to do out there if you’re going to deal with the Iron Horde . . . and you’re going to deal with the Iron Horde! Maximizing your effectiveness—and your chances of success—requires a couple of large buildings. Large plots can hold the Alliance’s Mage Tower or its Horde equivalent, the Spirit Lodge; the Barracks; the Dwarven Bunker (Alliance) or War Mill (Horde); the Stables; or the Gnomish Gearworks (Alliance) or Goblin Workshop (Horde). This Mage Tower is remarkably powerful. From the moment you build one (or its Horde variant, the Spirit Lodge), you’ll start collecting Ogre Waystones from ogres on Draenor. The building then becomes one end of a system of two-way portals via Ogre Waygates you’ll find in every zone on Draenor. You’ll use the Waystones to activate one gate at a time at building level 1, two at level 2, and three at level 3. With the Stables, you can capture and train special mounts on Draenor. These unique mounts spawn all across the world, and after you find and lasso them, you’ll send them to your Garrison for training. The subsequent training quests will allow you to add the mounts to your collection, learn the ability to remain mounted while interacting with objects in outdoor Draenor zones (at Stables level 2), and ultimately reward you with an increased mounted speed across Draenor at level 3. Achievements associated with this remarkable building unlock even more mounts, as well as the title Stable Master. When you go large, perhaps the Gnomish Gearworks or Goblin Workshop will catch your fancy. It’s a veritable toy store, granting access over the first two levels to unique items such as the Robo-Rooster, Personal Delivery System, Sentry Turret Dispenser, and Micro-Jetpack. Then at building level 3, the real fun begins, as you gain the ability to deploy a siege vehicle to take out for a spin. And by “out,” we mean right out of the Garrison and anywhere on Draenor—yes, that includes Ashran. No one ever said it’s going to be easy to choose your buildings! While you’ll certainly have the option to tear down a building and replace it with a different one, knowing your options ahead of time will help you better plan your Garrison to reflect your character’s style and needs. If you missed it, check out part 1 of our Garrisons preview here. In part 3, we’ll take a closer look at Followers, missions, and how you’ll use them to bring home rewards. If you’re beta testing Warlords of Draenor with us and have any Garrison-related questions or experiences to share, head over to our Beta General Discussion forum and post it there. You can also leave a comment below. With Patch 6.0 only a few weeks away, ~15 GB of data went up on the Background Downloader. It was disabled soon after due to some issues with the size. 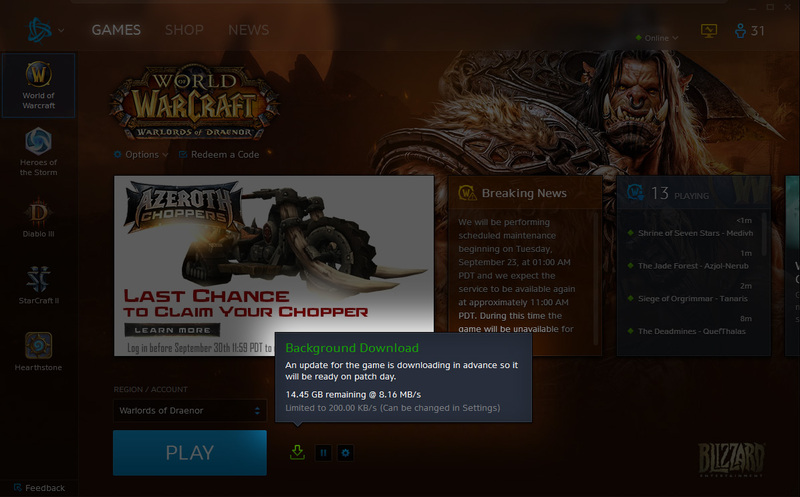 As some of you may have noticed the background downloader for patch 6.0.2 began today. After discovering issues with the size of the download, however, we have deactivated it for the time being. We'll let you know once when we're ready to start the 6.0.2 background downloader again, as well as provide you with some additional details on how it works and what you can expect when downloading the 6.0.2 patch in advance of its release on live realms. Build 18922 will be deployed to the Beta realms soon. Thy Kingdom Come Win Kor'lok's favor for your faction by defeating his bodyguard, Muk'Mar Raz. 10 points. Gaul Dun Firok. 10 points. Working Many Orders Complete 150 Complete 750 Work Orders at your garrison. 5 points. Working More Orders Complete 75 Complete 250 Work Orders at your garrison. Reward: Unlocks account-wide Level 3 profession blueprints. 5 points. Working Some Orders Complete 25 Complete 125 Work Orders at your garrison. 5 points. Draenor Safari Catch every battle pet in Draenor. 5 points. Account Wide. Pet Reward: Royal Peacock. 5 points. Account Wide. So. Many. Pets. Collect 600 unique pets. Pet. Reward: Stormwing. 10 points. Account Wide. Grand Treasure Hunter Find even more treasures in Draenor. 10 points. Discover 200 treasures of Draenor. 10 points. Master Treasure Hunter Find more treasures in Draenor. 10 points. Discover 50 treasures of Draenor. 10 points. Treasure Hunter Discover the Discover 10 treasures of Draenor. 10 points. I Was Framed! Bait Cinderwing Bait Darkwing Matron into ambushing a Darktide Rylakinator-3000 in Darktide Roost. 10 points. Planned to Fail Destroy 10 Secret Battleplans Warplans in Iron Siegeworks. 10 points. Poisoning the Well Poison 50 Poison 10 Kegs of Impaler Ale in Iron Siegeworks. 10 points. You Have Been Rylakinated! Defeat 10 Cinderwing Adolescent Darkwing Adolescents within 3 minutes while driving a Rylakinator-3000 in Darktide Roost. 10 points. Glory of the Draenor Hero Complete the Draenor Heroic dungeon achievements listed below. Reward: Armored Bloodtusk. 25 points. Account Wide. Mount Reward: Frostplains Battleboar. 25 points. Account Wide. Item - Death Knight T17 Unholy 2P Bonus When Soul Reaper deals its bonus damage to a target, you gain 3 stacks of Shadow Infusion. 5 stacks of Shadow Infusion. Item - Druid T17 Balance 2P Bonus Reduces the cast time of Wrath and Starfire by 15%. 12%. Item - Druid T17 Feral 2P Bonus Dealing bleed damage generates 3 Energy. 2 Energy. Item - Druid T17 Feral 4P Bonus While Berserk is active, special attacks deal an additional 15% 35% bleed damage to the target over 6 sec. Item - Monk T17 Windwalker2P Bonus Fists of Fury generates 4 stacks of Tigereye Brew. 1 stacks of Tigereye Brew. Item - Warrior T17 Arms 4P Bonus Colossus Smash has a 50% 40% chance to reduce the cooldown of Mortal Strike by 50% for 10 sec. Item - Warrior T17 Fury 2P Bonus Raging Blow critical strikes have a 25% chance to activate Enrage. 10% chance to activate Enrage. Item - Warrior T17 Fury 4P Bonus While Recklessness is active, your attack speed and critical strike chance increase by 5% every second. 6% every second. Blackout Kick (New) Minor Glyph. Instant. Glyph of Blackout Kick (New) Your Blackout Kick always deals 30% additional damage over 4 sec regardless of positioning but you're unable to trigger the healing effect. Minor Glyph. Pulverize A devastating blow that consumes 3 stacks of your Lacerate on the target to deal (400% of weapon damage) Physical damage, and reduce damage taken by 15% for 10 12 sec. Requires Bear Form. Druid - LvL 0 Talent. Melee range. Instant. Dire Beast Summons a powerful wild beast to attack your target for 15 sec. Each time the beast deals damage, you will gain 5 2 Focus. Hunter - LvL 60 Talent. 40 yd range. Instant. 30 sec cooldown. Black Arrow Fires a Black Arrow at the target, dealing [*50% [*10 + 40% of AP*] damage over 20 sec. Your Black Arrow periodic damage has a 20% chance to trigger Lock and Load, causing your next two Explosive Shots to cost no Focus and trigger no cooldown. When Black Arrow is dispelled, its cooldown is reset. Requires Ranged Weapon. Hunter - Survival Spec. 35 Focus. 40 yd range. Instant. 30 sec cooldown. Wizardry Increases your Intellect by 5%. Passive. Requires Cloth. Passive. Meteor Calls down a meteor which lands at the target location after 3 sec, dealing [*1 + 375% of Spell Power*] Fire damage, split evenly between all targets within 8 yards. Also burns the ground, dealing an additional [*30% of Spell Power*] Fire damage every 1 sec for until cancelled 8 sec to enemies in the area. Mage - LvL 0 Talent. 1% of Base Mana. 40 yd range. Instant. 45 sec cooldown. Prismatic Crystal Arcane, Fire: Conjures a prismatic crystal at the target location, which is attackable by only the Mage, and takes 30% additional damage. When the crystal takes damage, it instantly releases a burst of energy dealing that damage, split evenly between all enemies within 8 yards. Frost: Conjures a prismatic crystal at the target location, which is attackable by only the Mage, and takes 50% additional damage. When the crystal takes damage, it instantly releases a burst of energy dealing that damage, split evenly between all enemies within 8 yards. Mage - LvL 0 Talent. 40 yd range. Instant. 60 sec cooldown. Crusader Strike 5% 10% of Base Mana. Sanctuary Decreases damage taken by 15% 10%, increases your chance to dodge by 2%, and reduces the chance for your attacks to be parried by 3%. Paladin - Protection Spec. Mysticism Increases your Intellect by 5%. Passive. Requires Cloth. Passive. Saving Grace Instantly heals a friendly target for [*1 + 630% of Spell Power*]. Reduces your absorbs and healing done by 10% for 8 sec, stacking up to 10 times. Can be cast in Spirit of Redemption. Can't be cast in Shadowform. Priest - LvL 0 Talent. 3% of Base Mana. 40 yd range. 1.5 sec cast. Windstrike Hurl a staggering blast of wind at an enemy, dealing Physical damage equal to 170% 250% weapon damage, bypassing armor, and granting you an additional 25% chance to critically strike that enemy with your Lightning Bolt, Chain Lightning, Lightning Shield, and Earth Shock for 15 sec. Damage is increased by 0% while Lightning Shield is active. Requires Melee Weapon. 1% of Base Mana. 30 yd range. Instant. 7.5 sec cooldown. Windstrike Hurl a staggering blast of wind at an enemy, dealing Physical damage equal to 170% 250% weapon damage, bypassing armor, and granting you an additional 25% chance to critically strike that enemy with your Lightning Bolt, Chain Lightning, Lightning Shield, and Earth Shock for 15 sec. Damage is increased by 0% while Lightning Shield is active. Requires Melee Weapon. 100 yd range. Instant. Windstrike Off-Hand Hurl a staggering blast of wind at an enemy, dealing Physical damage equal to 170% 250% weapon damage, bypassing armor, and granting you an additional 25% chance to critically strike that enemy with your Lightning Bolt, Chain Lightning, Lightning Shield, and Earth Shock for 15 sec. Damage is increased by 0% while Lightning Shield is active. Requires Melee Weapon. 100 yd range. Instant. Nethermancy Increases your Intellect by 5%. Passive. Requires Cloth. Passive. Empowered Execute (New) Increases the damage of Execute by 20%. Slam Slam an opponent, causing (100% 150% of weapon damage) Physical damage. Each consecutive use of Slam increases the damage dealt by 50% and the Rage cost by 100%, stacking up to 2 times for 2 sec. Requires Melee Weapon. Warrior - LvL 45 Talent. 10 Rage. Melee range. Instant. Mastery: Weapons Master Increases the damage of your Mortal Strike, Colossus Smash, and Execute abilities by 20%. Warrior - Arms Spec. 28%. Warrior - Arms Spec. Ancestral Talisman Consultation with the spirits of previous generations is considered essential to Shadowmoon shamans whenever an important decision is to be made. Talismans and other relics that were important to an ancestor during life provide a more clear spiritual conduit for shamans to speak to them in the afterlife. 2 sec cast. Archaeology. 2 sec cast. Ancient Frostwolf Fang In life, no two creatures will share a stronger relationship than that of a Frostwolf orc and his or her companion wolf. The two eat, sleep, and fight side by side until one or both dies an honorable death. Even then, sometimes not even death itself can stop a frostwolf from coming to the aid of its beloved orc. 2 sec cast. Archaeology. 2 sec cast. Ancient Nest Guardian Harnessing the power of the sun as a never-ending fuel, these constructs were originally built as automated caretakers for young Arakkoa. With the conflict escalating between the Adherants of Ruhkmar and the Outcasts, many have been repurposed as instruments of war. 2 sec cast. Archaeology. 2 sec cast. Apexis Crystal Scattered in the most ancient of ruins on Draenor are fragments and whispers of the Apexis civilization, who attained a height of power during the Age of Order and then abruptly vanished. The arrival of the Iron Horde has prompted a secret but urgent escalation in retriving Apexis artifacts by the Adherents. 2 sec cast. Archaeology. 2 sec cast. Apexis Hieroglyph Brittle and ancient beyond measure, this stone tablet contains carvings that vaguely describe an engine of incredible power, claiming to harness the power of the sun. 2 sec cast. Archaeology. 2 sec cast. Apexis Scroll This battered scroll case has corroded shut, and the scroll within is barely readable with very careful examination. These appear to be plans and measurements for a glorious "Temple in the Sky," written in an ancient hand. It's unclear whether such a splendid structure was ever built. 2 sec cast. Archaeology. 2 sec cast. Barbed Fishing Hook This arm-length nest of barbs has less in common with a traditional fishing hook and more with an elaborate halberd. You can only imagine the size of the leviathan that could be pulled in by such a hook, and it's no surprise that most orcs prefer to hunt their prey from land. 2 sec cast. Archaeology. 2 sec cast. Beakbreaker of Terokk Eschewing traditional Arakkoan weaponry, Terokk carried this cudgel as a symbol of his fall from king to outcast heretic. Rumors have persisted for centuries that rather than employing traditional wing-cutting as a punishment, Terokk simply shattered the beaks of those who dared to oppose him. 2 sec cast. Archaeology. 2 sec cast. Blackrock Razor Male orcs of the Blackrock Clan never cut their hair until they come of age, at which point their head is shaved and their role in this extremely regimented society is determined. This ancient switchblade is forged of blackrock and embellished with jewels, likely used by a prominent family for many generations of initiation. 2 sec cast. Archaeology. 2 sec cast. Burial Urn In death all Arakkoa seek to join the Sun-God Rukhmar in the skies above Draenor, thus cremation is vastly preferred to burial. Some have their ashes scattered high in the skies, others are collected in ornate urns and placed in crypts. 2 sec cast. Archaeology. 2 sec cast. Calcified Eye In a Jar This well-preserved eye must have once belonged to a chieftain of the Bleeding Hollow clan. Upon ascension to ruler of the clan, each chieftain undertakes a shamanic vision quest in which they sacrifice their own eye to receive a vision of their own death. You can only imagine the grisly fate this clouded eye bore witness to. 2 sec cast. Archaeology. 2 sec cast. Ceremonial Tattoo Needles These bone needles are taken from the corpses of fallen enemies and meticuously sharpened. The mystics of the Shadowmoon often inscribe secret runes into their flesh to more clearly speak to their ancestors and the elemental spirits. 2 sec cast. Archaeology. 2 sec cast. Cracked Ivory Idol An example of the Void worship once practiced but now banned by the Shadowmoon Clan elders, this idol is as dark as the night sky. Roughly and frantically chiseled from the tusk of what must have been a colossal Elekk, this idol was dyed and is inlaid with complex swirling and jagged patterns. 2 sec cast. Archaeology. 2 sec cast. Decree Scrolls The incomplete writings here seem to indicate a decree of a sort of martial law, and reminders to be vigilant for signs of the curse amongst neighbors and friends. 2 sec cast. Archaeology. 2 sec cast. Doomsday Prophecy This tablet speaks of the "end times." From what you can decipher, the crude scrawls of multiple authors speak of at least seven different and sometimes conflicting versions of a final reckoning for all of the inhabitants of Draenor. Eerily, the iconography of a flaming hammer is clearly depicted - is this the ancestral origin of the Twilight's Hammer clan? 2 sec cast. Archaeology. 2 sec cast. Dreamcatcher When Terokk returned from exile he was broken and flightless. Rumors of his cursed state swept like wildfire through the Arakkoa, giving rise to superstitious charms and cures. Dreamcatchers endure as one of the most clung-to icons of safety, for the Arakkoa believe the curse will entangle itself in the dreamcatcher and fade in the morning sunlight. 2 sec cast. Archaeology. 2 sec cast. Elemental Bellows The Blackrock Clan originally used the naturally occurring elemental-fueled infernos of ancient Draenor to shape and harden their namesake ore. A Shaman could use these bellows to channel the power of a fire spirit directly to a blast furnace, allowing the Blackrock to set up forges anywhere. 2 sec cast. Archaeology. 2 sec cast. Eye of Har'gunn the Blind While most ogres are born with two eyes, a handful in every generation regress and are born with a single eye. All but a few clans recognize these ogres are exceptional and destined for great things. An unlucky one-eyed ogre mage lost his eye in a duel and replaced it with this fist-sized stone, discovering it to have magical properties when he did so. 2 sec cast. Archaeology. 2 sec cast. Fang-Scarred Frostwolf Axe In order to be granted full standing within the Frostwolf clan, each member must undertake a solo quest to befriend and bond with a wild Frostwolf. Not all clan members pass this trial, but those that do earn a lifelong companion. 2 sec cast. Archaeology. 2 sec cast. Flask of Blazegrease Sticky, smelly, and highly flammable, the substance in this small container is liberally applied to the swords and axes of the Burning Blade clan before battle. Though some warriors choose to ignite their weapons before battle, most let the inevitable contact of blades and armor spark the blazegrease for unpredictable intimidation. 2 sec cast. Archaeology. 2 sec cast. Frostwolf Ancestry Scrimshaw As part of the rite of passage into adulthood, a Frostwolf orc must slay a frostboar and carve their family genealogy as far back as will fit on the creature's largest tusk. Family history and tradition are of great importance to the Frostwolf clan, so the largest frostboars are hunted each season to preserve clan lineage. 2 sec cast. Archaeology. 2 sec cast. Gladiator's Shield Disagreements between ogres usually end in violence. During the early decades of the Age of Order, a sly chieftain decreed that disputes in his clan would be settled via proxy in one-on-one combat between slaves. The mortality rate amongst the ogres plummeted, leading to a golden age of expansion. 2 sec cast. Archaeology. 2 sec cast. Gronn-Tooth Necklace The Thunderlords are the greatest big game hunters in all of Draenor. For centuries they have used riding beasts and coordinated assaults to slay game and gronn alike. Their clan draws their name from an ancient chieftain who single-handedly slew a powerful gronn at the pinnacle of Thunder Peak. 2 sec cast. Archaeology. 2 sec cast. Headdress of the First Shaman Learning to speak with the elemental spirits of Draenor was a pivotal achievement in destiny the Orc clans. Many clans claim the mythical "First Shaman" arose from their ranks, but the truth is that no one is sure of his or her allegiance. 2 sec cast. Archaeology. 2 sec cast. Hooked Dagger The Shattered Hand celebrate victory in battle with self-mutilation. Their most celebrated warriors are covered with scars and piercings, and it becomes increasingly difficult with age to tell which were inflicted by enemies or by the triumphant orc. 2 sec cast. Archaeology. 2 sec cast. Imperial Decree Stele Assembled fragments from this stone stele place it in Talador several hundred years before the draenei arrived. It marks an ogre imperial decree to raze several orc settlements in retaliation for a number of rebellious raids against Gorian slave trade caravans. The orders were likely carried out, since the towns no longer exist, and this stone was erected to memorialize the dark deed. 2 sec cast. Archaeology. 2 sec cast. Metalworker's Hammer Despite many dents and scratches, you can see the Blackrock clan iconography etched in to this once-proud hammer. The first of the Orc clans to master the art of shaping their namesake metal, the Blackrock prefer to wield blunt weaponry in battle to honor their ancestors. 2 sec cast. Archaeology. 2 sec cast. Mortar and Pestle Preferring to show off their physique, ogres eschew garments that cover too much skin. In order to look more fearsome to their enemies, they adorn their bodies with warpaints created in these grinding tools. This mortar and pestle set is stained yellow, indicating it was used by the Boulderfist clan. 2 sec cast. Archaeology. 2 sec cast. Ogre Figurine Expressing with sculpture what most ogres could struggle to explain in words, this statue summarizes the most important ogre physical attribute: size. The clefthoof held above the ogre's head displays strength, while the robust waistline symbolizes great wealth. 2 sec cast. Archaeology. 2 sec cast. Outcast Dreamcatcher Outcast Arakkoa have repurposed the dreamcatcher not to ward off the Curse of Sethe, but to capture and harvest tiny amounts of essences from their lost gods. Rumors persist of an ever-growing mass of swirling energy buried deep beneath Skettis, whispering promises of power to any who will listen... 2 sec cast. Archaeology. 2 sec cast. Pictogram Carving While the written word is mostly used as an instrument for the upper echelons of imperial ogre society, occasionally an ordinary ogre will try his hand at making a story immortal. This pictogram appears to tell the story of an especially distressing culinary experience. 2 sec cast. Archaeology. 2 sec cast. Rylak Riding Harness A brilliant ogre once had a thought that riding a rylak would make travel much faster than using pack animals or walking. Roughly crafted from thick leather and utilizing an excessive number of knots, this seat could comfortably accomodate an ogre. However, it could only be saddled on a rylak the size of a small mountain which seems to explain why no one has ever seen ogres fly. 2 sec cast. Archaeology. 2 sec cast. Screaming Bullroarer A bullroarer is an arm-length piece of rigid wood affixed to the end of a long rope and spun over the wielder's head to generate a droning noise capable of traveling long distances. This example was grooved by the Warsong to emit a high-pitched whistling noise rather than the low hum used by most other clans. 2 sec cast. Archaeology. 2 sec cast. Solar Orb Central to High Arakkoan culture is reverence of Rukhmar and the sun. Hundreds of Solar Orbs are scattered around Skyreach, which cast a never-ending light so no Arakkoan need go without the sun's warmth, even on a cold and overcast day. 2 sec cast. Archaeology. 2 sec cast. Sorcerer-King Toe Ring Imperial ogres jealously guard the secrets of magic in order to keep their status among the ruling class. The wealthiest among them adorn themselves with magically-enhanced jewelry and other wearable artifacts. 2 sec cast. Archaeology. 2 sec cast. Stone Dentures Ogres are straightforward in combat and often suffer as much punishment as they dish out, relying on their strength and stamina to carry them to victory. These serrated-tooth dentures are proof that at least one ogre had all of his teeth knocked out and lived to fight another day. 2 sec cast. Archaeology. 2 sec cast. Stone Manacles Rather than using clasps and locks, Ogres bind their slaves using unbroken stone circlets. Their centuries of manipulating earth elements lets them simply shrink the manacles tightly around the slave's ankles, wrists, or neck. 2 sec cast. Archaeology. 2 sec cast. Stonemaul Succession Stone Chieftains rule small bands of ogres with an iron fist, and are never short on challengers. The Stonemaul clan have notoriously high turnover rate in their leadership; judging from the layers of bloodstains this stone appears to have been instrumental in deposing multiple Stonemaul chieftans. 2 sec cast. Archaeology. 2 sec cast. Sundial This delicately-engraved instrument, when positioned correctly, acts as both a sundial and an arakkoa seasonal calendar. The base of the instrument is covered with callouts for celestial events, most of which are accompanied by grave warnings. Interestingly, the device seems to have cryptically predicted the arrival of the draenei a century before it happened. 2 sec cast. Archaeology. 2 sec cast. Talonpriest Mask Believing they have been abandoned by the sun, cursed Arakkoa prefer to hide in the forests or beneath awnings during daylight hours. Talonpriests take this a step further and never show their faces to the sun, wearing ritual masks that act as a focus for their communes with Anzu. 2 sec cast. Archaeology. 2 sec cast. Warmaul of the Warmaul Chieftain The first great technological innovation in ogre society was the concept of attaching a rock to the end of a very long stick to smash your enemies, rather than attempting to bash them with a rock held in your hand. The schism this innovation created amongst ogre society resolved itself only when the now-forgotten tribe broke in to the Warmaul and Boulderfist clans. 2 sec cast. Archaeology. 2 sec cast. Warsinger's Drums Relying on shock and awe to overwhelm their enemies, the Warsong earned their name from their fearsome battle cries and thunderous drum marches. These macabre drums are constructed of Talbuk leather stretched tightly over what appear to be ogre skulls, celebrating the clan's freedom from the ogre empire. 2 sec cast. Archaeology. 2 sec cast. Warsong Ceremonial Pike The riders of the Warsong clan are always on the move. In camp, a family's tent is marked with a long pike thrust into the ground - often adorned with the skulls of defeated enemies. This example is over a hundred years old and is branded with the names of several key battles. 2 sec cast. Archaeology. 2 sec cast. Weighted Chopping Axe Taking their namesake literally, warriors of the Shattered Hand clan will ritualistically smash their own hand before cutting it off. The stump is cauterized and replaced with one of many varities of weaponry. This blade, which resembles a simple butcher's cleaver, is heavily weighted to assist in making a single clean cut at the wrist. 2 sec cast. Archaeology. 2 sec cast. Wolfskin Snowshoes With the icy Frostwind desert providing little vegetative nourishment, the Frostwolf depend on their hunters for sustenance. These snowshoes, constructed of wolf bones and pelts, help keep trackers from sinking into deep drifts while pursuing prey. 2 sec cast. Archaeology. 2 sec cast. Greater Assault Permanently enchant boots to increase attack power by 16 8. Cannot be applied to items higher than level 600. Enchanting. 1.5 sec cast. Reagents: Greater Cosmic Essence (4), Dream Shard (4). Tools: Runed Copper Rod. Greater Potency Permanently enchant a melee weapon to increase attack power by 25 12. Cannot be applied to items higher than level 600. Enchanting. 1.5 sec cast. Reagents: Infinite Dust (2), Lesser Cosmic Essence (4). Tools: Runed Copper Rod. Lesser Protection Permanently enchant a cloak to increase armor by 20 2. Cannot be applied to items higher than level 600. Enchanting. 1.5 sec cast. Reagents: Strange Dust (6), Small Glimmering Shard. Tools: Runed Copper Rod. Major Armor Permanently enchant a cloak to increase armor by 120 12. Cannot be applied to items higher than level 600. Enchanting. 1.5 sec cast. Reagents: Arcane Dust (8). Tools: Runed Copper Rod. Savagery Permanently enchant a two-handed melee weapon to increase attack power by 70 35. Cannot be applied to items higher than level 600. Enchanting. 1.5 sec cast. Reagents: Large Prismatic Shard (4), Arcane Dust (40). Tools: Runed Copper Rod. Tectonic Upheaval Tectus unleashes his built up seismic instability into the earth, creating a massive series of earthquakes that each inflict 30,000 35,000 Nature damage to all players. If Tectus's health is depleted during Tectonic Upheaval, he will Shatter. Instant. With a little over a month to go before Patch 6.0, it is time to take a look at the things you may want to do before it is too late. Our friends over at OpenRaid have lots of groups to help you cross things off of your list. All of the challenge mode achievements are becoming Legacy and Feat of Strength achievements, with all of the rewards other than the armor sets and teleport spells becoming account wide. Bronze - The Undaunted title will be unobtainable and account-wide. Silver - The mounts will be unobtainable and account-wide. If you have at least one of the mounts, all four of the mounts will be unlocked. These mounts could come in handy when trying for the new 250 Mounts achievement and the Felfire Hawk that comes with it! Gold - The transmog armor sets and teleport spells will be unobtainable and remain character specific. The Gold guild achievement that rewards a pet will be unobtainable. Along with the difficulty changes coming in Patch 6.0, some rewards are also going away. The Ahead of the Curve 10 and 25 achievements for killing Normal Garrosh will no longer be obtainable. These reward the Kor'kron War Wolf mount. The Cutting Edge 10 and 25 achievements for killing Heroic Garrosh will also no longer be obtainable. These achievement have no reward. The Kor'kron Juggernaut mount that drops from Heroic Garrosh isn't going away, but after Warlords is live it will be a rare drop instead of guaranteed. If you are still trying for some Siege of Orgrimmar loot, the Warforged Seal will no longer have a weekly cap. Heirloom items will cost gold instead of Justice Points once Patch 6.0 is live. The prices are currently 500 to 1500 and another 500 to 1000 to upgrade them. Also keep in mind that the Heirlooms collection tab was delayed. The Level 90 Proving Grounds achievements will become Legacy achievements. The rewards will still be available from the new Level 100 achievements. The Season 1 Brawler's Guild achievements will become Legacy achievements. The rewards will still be available from the new Level 100 achievements. Valor Points achievements will become Legacy achievements. The old UBRS achievement will become a Legacy achievement. The Leeeeeeeeeeeeeroy! achievement will become a Legacy achievement. You can still earn the title from the new Leeeeeeeeeeeeeroy...? achievement. The Breaker of the Black Harvest achievement that rewards the Black Harvest title. Log in by September 30, 2014 to get the Horde Chopper mount. The Overgrown Lilypad and Fire Spirit will become useless. Commendation Badges for Wrath of the Lich King reputations may be going away. Currently they are not sold by the vendors that sell them on live. Our target for both healing and dungeon tuning is something of a middle ground between Mists and Cataclysm. It's important to note that healer balance is not yet final, and damage output in our dungeons (especially pure melee damage on tanks, in light of recent mitigation changes) is still being adjusted. So in terms of the raw numbers, we're not quite there yet. The most helpful thing testers can provide is actionable feedback with regard to specific encounters (also specifying difficulty and which spec you were playing). We're listening and making changes on a daily basis. That said, I'd like to help clarify our goals with respect to both healer gameplay and dungeon tuning. Healing in Mists, especially in raids and especially later in the expansion, suffered from three major problems: 1) the power of healing relative to player health pools meant that injured players could be topped off almost instantly; 2) mana became increasingly irrelevant as a constraint, with many healers actively reforging out of Spirit; and 3) "smart heals" accounted for a very large portion of healing done, meaning that for some healers their targeting decisions were almost meaningless. Now, some might be thinking, "so you're saying healers were really strong - that sounds great to me!" The problem is that when healing was in that state, the only way we could kill someone in a raid or dungeon was with massive damage, fatal if the healer didn't react instantly; it led to sudden spike deaths, punished latency, and made healing more like whack-a-mole and less like a series of tactical decisions. And in raids, as soon as maximizing throughput becomes all that matters, healing risks turning into a rotation performed irrespective of the encounter or the incoming damage. Our goal is not to make healing more difficult. Note that nowhere in the above did I say that a problem with Mists healing is that it was too "easy." We want to slow down the pace a bit, and for the challenge in healing to lie more in making decisions about spell usage and targeting, and less in twitch-reaction and sustaining a DPS-style rotation. This also means that the cost of a mistake is not a dead player, but rather a more injured one, giving you a chance to fix your error. In Cataclysm, fresh 85s had very little mana regen, and if they attempted to heal a dungeon the way they'd been accustomed in late Wrath (e.g. lots of Flash Heals), they'd quickly run out of mana. In Warlords, players have significantly higher base regen, and less available Spirit from items, so that you'll start off with a much deeper mana pool than is usually the case as a new max-level healer, while avoiding the problem of mana becoming irrelevant once in endgame epics. In Cataclysm, nearly your only efficient heal was also your smallest, and it was easy to run yourself out of mana and feel helpless as you watched your group die; in Warlords even if you are running on fumes mana-wise, you can still sustain a steady stream of Greater Heal or Healing Touch or the equivalent. You aren't helpless. Now, as for dungeon difficulty, one of the challenges in adapting to new dungeons at the start of an expansion has been the contrast between players' habits at the end of the last expansion when they massively outgear every dungeon, and the different approach required when undergeared and running a dungeon for actual loot drops instead of currency. The ability to recklessly pull multiple packs of mobs at once and cleave everything down is something that you earn and grow into as your gear and knowledge of the content increases - that's never been the intended dungeon gameplay when the content was brand new, even for our "easy" dungeons in Wrath or Mists. Normal dungeons should be pretty easy. Some of them aren't quite there yet. But you should feel confident that you can push the "Dungeon Finder" queue button and land in a random group with a high chance of success. If you don't feel that way about a given Normal dungeon (especially a level-up dungeon), please let us know why not. We have a solid chunk of level 100 Normal dungeon content that everyone should be able to jump into when they hit max level, and Normal dungeon loot will be sufficient to qualify you for Highmaul LFR when that unlocks. Heroic dungeons will be somewhat more challenging, which is the reason for the Silver Proving Grounds requirement to random-queue for them. We're not looking to recreate Heroic Stonecore or Grim Batol or The Arcatraz, but there's a middle ground where mechanics can still matter. Finally, it's also worth noting that in beta, we're scaling players down to pretty much the lowest possible level and item level at which you could be running a given dungeon. Nearly all groups in the live game will be better-equipped, but we need to make sure the content is viable at the minimum threshold. theres a reason that you arent seeing wht the players are.Dont dismiss the input of players just bc we arent devs. Are dps attunements a hard rule for what should be our best stat? Is another secondary stat 'beating' the attunement stat ok? I agree. If raid CDs were a problem, why not remove from all DPS (stackable) vs. from tanks (static)? Do you mean it's impossible to remove almost all CDs from DPS vs tanks or do you mean it's harder to? but what about the passive talents? Is it bloat to nerf and make them baseline? Do you think there's any chance that in the future Death Knights will start at level 1? It's weird them being the odd ones out. Will Marksmanship be tuned as a stand-still caster or a mobile dps? Curious since right now it is sort of both. Will Marksmanship have a higher DPS than SV and BM when standing still? If not, what's the point? interrupting what flow? the leveling? you have scenarios now that you're incorporating in the leveling. new mechanics that you hate? people tend to despise something at first because they're not used to it. Take Vehicle quests e.g. Thanks for a fast response! Is the only new Hallow's End thing the Lich King costume or are there more additions? Do followers stationed at garrison buildings count as active? He only mentions missions. Not sure why needs 250g to activate. Just don't let it send another NPC past 20. Why does everything have to cost gold? I thought there would be something else. Is that the idea, for people to be making their gold from the AH? How long do work orders take, and are extra work orders intended to just be "do 5 dailies on alt and come back in a week"? Can this lv3 Gladiator's Sanctum perk (reduce 50% damage when below 35% life) effective in Ashran PVP zone? DLC #457 takes a look at the state of questing.